The Royal Philharmonic Orchestra opened its 2017/18 season with a programme of music by Howard Blake, conducted by the composer. The centrepiece of the programme was Blake's Piano Concerto, originally commissioned by the Philharmonia Orchestra to celebrate the 30th birthday of Diana, Princess of Wales in 1991. Blake himself performed the taxing piano part at the premiere, this time he conducted with Sasha Grynyuk at the piano. Cellist Benedict Kloeckner was the soloist in Blake's Diversions for cello and orchestra (a work originally written for Maurice Gendron), and Kloeckner was joined by violinist Nicolas Dautricourt to give the premiere of Blake's Elegia Stravagante (Duo Concertante) for violin, cello and orchestra. The evening opened with a new version of Blake's Sleepwalking for soprano and string orchestra, with soprano Sophie Witte. Howard Blake remains best known for his music for the animated film The Snowman, with the song Walking in the air remaining inextricably linked with the composer's name. But his career has been far wider and varied than this, encompassing film music including Ridley Scott's The Duellists as well as a substantial body of concert music. But if you only know Blake from The Snowman and the film music, his concert music can be something of a surprise. Tonal and approachable in a tradition that links Blake to his original composition teacher at the Royal Academy of Music, Howard Ferguson, Blake writes large scale pieces of great depth and complexity. (Read my interview with Howard Blake). Sleepwalking was originally written as a companion piece to Villa Lobos' Bachianas Brasileiras No. 5, for the same forces soprano and eight cellos. In his programme note Blake talked about finding the idea of eight cellos conjuring up the world of dreams, and his piece posits a scenario of a young woman asleep who then goes sleepwalking through various traumas before returning to sleep. Starting from atmospheric high sustained strings with the soprano vocalise over the top (the whole piece is wordless) the piece moved through seven highly contrasting movements, finally returning to the tranquillo of the opening. We had a series of highly varied moods evoked by instrumental writing very much in the English tradition of string music, from lyrical through to darker dramatic episodes. Witte sang with a lovely even tone, and a beautiful freedom at the top. A well put-together piece which did not quite take me on the journey the composer intended, and I would be interested to hear the original version. Howard Blake's Piano Concerto is a large-scale dramatic work. It was in some ways the most conventional work in the programme, in three movements (the others were in seven or eight) and the only one to use classical sonata form. Christopher Palmer's 1991 programme note used the term Mozartian, but the composers who came to mind were Rachmaninov and Tippett; Rachmaninov for the big boned romanticism piece, particularly the piano writing, whilst Tippett for the way the piano texture sometimes eschewed showy bravura (but not complexity) and created a continuous texture which flowed over the orchestra.. The first movement started with an understated ear-worm on the piano alone, which Blake then developed into something more dramatic with tutti. 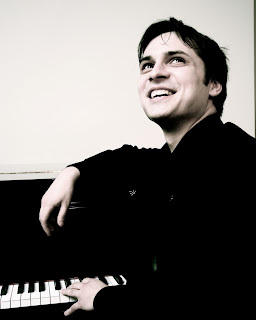 Sasha Grynyuk was tireless, and indeed the piano solo got little rest in this movement. Even the cadenza eschewed virtuosity and was rather thoughtful and, unusually, ended the movement. The second movement started with solo piano chords accompanying solo violins and viola, until the tables were turned. The melodic piano line wandered expressively, but always with an elegant simplicity, and finally the whole ensemble moved the temperature up a notch and we got something richly romantic. The final movement started with a perky piano toccata, and developed into a series of variations with hints of jazz/blues. Often highly vigorous, the jaunty melody passed round the orchestra, but always with the piano to the fore over the top. Towards the end we had a simple return to the main theme in the piano before the big finish. Blake's Piano Concerto is a terrific work, I enjoyed his recording of it (see my review) and I enjoyed this performance immensely. Sasha Grynyuk brought out the poetry in Blake's writing, and played the part with great flair. With longer rehearsal time, there would have been chance to iron out some of the issues of balance, Grynyuk's approach concentrated on poetry and nuance rather than sheer power, but overall he and the orchestra brought it off brilliantly and I hope it makes other orchestras interested. After the interval the German cellist Benedict Kloeckner played Blake's Diversions. Originally written for Maurice Gendron (who encouraged Blake to add a cadenza and generally make the piece more virtuosic), the premiere was given by Steven Isserlis in 1989. 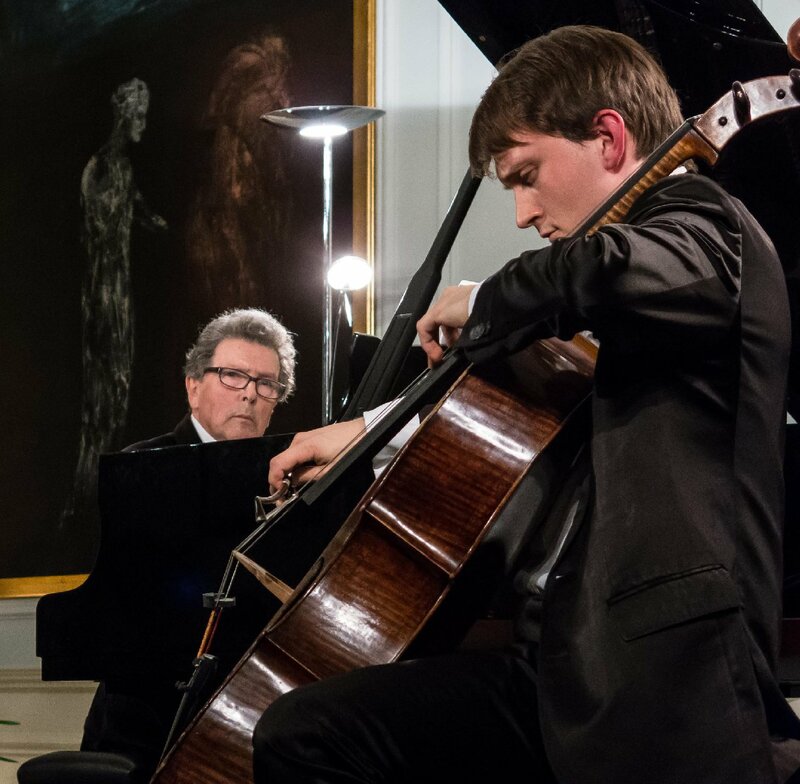 But then it slept somewhat until Kloeckner played the version for cello and piano in the semi-finals of the European Broadcasting Union Awards in Bratislava (and went on to win the competition). Subsequently Kloeckner had played the work a number of times with Blake accompanying on the piano. But for this concert we heard the original orchestral version. It is based on an instrumental dance suite, with eight movements encompassing scherzo, march, waltz, aria serenade and sarabande, though in each Blake develops things in interesting ways. We started with Kloeckner's cello singing over an intense rather dark orchestral accompaniment. The scherzo was full of character, and toccata-lie, whilst the march developed into a really big romantic solo for the cello (and Kloeckner really made the piece sing here). The waltz was wistful and rather sly, with the cello line weaving in and out of the orchestra, and the serenade had the solo duetting with the oboe before moving into the perky sarabande which developed into a cadenza which had orchestral comments (including not quite raspberries from the bassoons). The finale was fast and furious, and completely joyous. Kloeckner clearly loves this work, and the virtuosity of the piece seems to suit him, he made everything magically engaging. The final work in the programme was a new piece, Elegia Stravagante (Duo Concertante) for violin (Nicolas Dautricourt) and cello (Benedict Kloeckner). In seven movements, it started with violin and cello alone playing a melodic motif that sounded suspiciously like noodling, but in fact proved a fertile source for the musical inspiration of the piece. For much of the piece, the two soloists play together (in unison in some movements), and the effect was more like the structure of a baroque concerto rather than the large-scale battle of a full blown Romantic concerto. During the work's seven movements, Blake brings back the original motif repeated in vastly different guises, creating some intense and full blown romantic moments, interspersed with episodes using different material such as a 'jazz fugue'. The two soloists often soared in unison (at one point at a 16th) over the orchestra, and the was a notably intense solo moment for Benedict Kloeckner, whilst a rather threatening orchestral passage rather evoked Walton. For the ending, there was a sense of the piece gradually unwinding, a moment for violin solo turned into a duet with the cello and the piece ended with just the two of them returning to the original motif. This was a long and substantial concert, full of dramatic and complex music. It was a great pleasure to finally hear Blake's Piano Concerto live, as well as to experience the full orchestral colours in Diversions. Throughout Blake was supported by the sterling players of the Royal Philharmonic Orchestra, playing nearly two hours of complex and unfamiliar music, whilst the soloists encompassed the taxing demands of the solo parts in brilliant fashion. Let’s get one thing clear. Howard Blake has written plenty besides the music to the The Snowman. The septuagenarian British composer reminds me of this himself in no uncertain terms when we speak; not that I need it: the Royal Philharmonic Orchestra is doing a good job of that already, having scheduled a concert this September devoted to Blake’s orchestral output. He compares this predicament to that of Beethoven, who, in his lifetime ‘was known for a long time for having written Für Elise,’ and Rachmaninov, ‘who was celebrated for his C Sharp Minor Prelude.’ Admittedly, Blake’s career path was not as clear-cut as theirs: he spent a while working as a film projectionist at the National Film Theatre. But his musical credentials are unassailable: he played the piano and sang from childhood, then, at the age of 18, won a scholarship to the Royal Academy of Music. The Piano Concerto is one of the works that will feature in the RPO’s concert this September, marking 20 years since Diana’s death. There is one work, however, that Blake is itching to have performed in the UK: namely The Station, his 1991 chamber opera for five singers and two tea ladies. ‘It’s about waiting for trains that never come in, and it’s a super, very funny little opera. But I’ve never managed to get to know anybody in the opera world ever, so it’s rarely performed.’ Let’s hope that this upcoming RPO concert will convince music lovers that, when it comes to Blake’s compositions, a revival of interest is overdue. You might not know Howard Blake by name, but you’ll know his music. Blake is best known for his soundtrack to the classic kids’ film ‘The Snowman’ – music that has sent shivers downs the spines of millions. At this concert, the 78-year-old composer will be conducting the Royal Philharmonic Orchestra in a series of music he wrote around the life and death of Princess Diana. Collectively, it’s a bittersweet body of work: ‘Piano Concerto’ was written to celebrate the princess’s thirtieth birthday, while ‘Sleepwalking’ was a response to her tragic death in 1997 and a brand-new piece, ‘Elegia Stravagante’, commemorates its twentieth anniversary. Our offer brings ticket prices down from £40 to £20. Don’t miss the chance to witness an immensely talented musician conduct his own material. In London on Thursday 7th September, Benedict Kloeckner plays once again with the Royal Philharmonic Orchestra for the Howard Blake concert organized by the Cadogan Hall to commemorate the 20th anniversary of Lady Diana’s death. Howard Blake will conduct his works himself. This is not the first time the Made in France cellist is collaborating with the British composer, Blake’s Cello Sonata being composed for Kloeckner. He regularly works with contemporary composers such as Eric Tanguy and Wolfgang Rihm. Considered one of the most promising German cellists, Benedict Kloeckner is internationally recognized for his technical control and intonation. He regularly performs on prestigious stages around the world (Carnegie Hall, Berlin Philharmonic Hall, the Musikverein Wien). While he has performed before at the Cadogan Hall and at the Barbican Centre, this is Kloeckner’s first performance of an entirely British programme. Benedict Kloeckner is managed by the French agency CLB Management. To learn more about the Made in France cellist, click here.